Forgive yesterdays lack of post have spent the last two days sick in bed, which is so boring. However it has given me the chance to think about the business in ways I generally don’t have the time for.Â As you may know very soon we are revamping the website, launching an online monthly Style Guide and I also thought we should have a Design Channel. Design tube I’m calling it – little pocket videos about our Design School,Â tips and tricks on how you can transform your home, little pockets of advice that kind of thing. What do you think? The logistics are another thing altogether, finding someone to film it, put it to music etc. etc. but as a concept I think it could be fun no?. 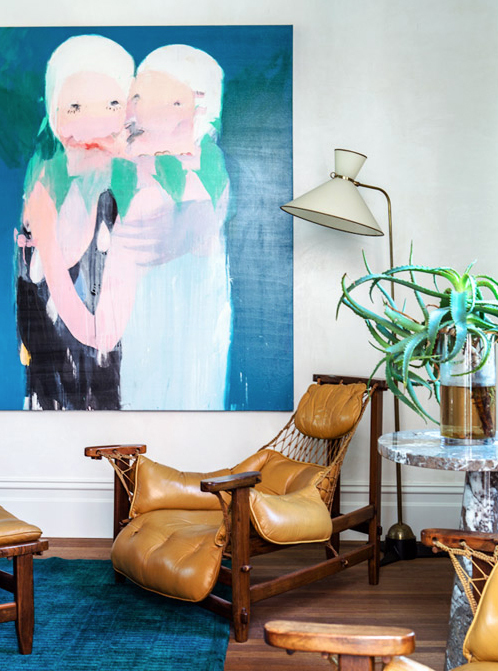 I’m a big believer that you don’t need to be an A list decorator or head honcho stylist to have a cool pad. All you need is their confidence and the ability to think a little differently when it comes to putting a room together. Many rooms may look like they’ve been just been slung together but often times they’ve been pondered over, sighed over, tweaked, re tweaked. Plus there are tricks, tricks of the trade that all we designers use time and time again. The more you do it the easier it becomes and the more confidence you get. You don’t need oodles of cash, style as I say a trillion times has nothing to do with money but you will need to take a few gambles. With colour, with scale, with art, with furniture, layering, texture, pattern, lighting (am I scaring you)? Below a cool vignette I found on the Design Files – and a good example of how it doesn’t take a lot to create a cool space.